Ponds, streams, pathways and vibrant gardens as far as the eye can see. What started out as a landscape architecture project is now a six-acre complex attracting thousands of visitors every year. The Kula Botanical Garden is home to a large collection of Hawaiian flora and fauna, including birds, palms, reef fish and the island's official flower, the protea. Among the highlights of the Kula Botanical Garden are large koi ponds, stone sculptures, rock formations and a carved tiki exhibit. Each plant is labeled with its common name, botanical name and country of origin. Every piece has a story to tell; educational plaques around the garden provide interesting information. 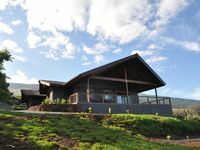 The garden is located on the slopes of Haleakala, a large, dormant volcano. This gives it an uneven landscape and makes for an interesting trail, a feature enjoyed by many avid hikers. From the high lookouts, you can actually see the nearby Big Island of Hawaii, although it sometimes appears faint through the mist. Self-guided tours are the most popular way to explore the garden. Lookouts, restrooms, picnic tables and other facilities are located throughout the area, so you can stop and rest anytime. The best times to go are in the early morning or late afternoon, when the weather is cool and the colors appear more vibrant. 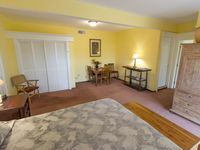 2BR Suite with Hot Tub & Fruit Trees, on the Way to Haleakala National Park! 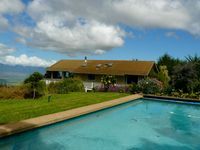 Private Home with Pool & Fruit Trees, on the Way to Haleakala National Park!